land. And his son replaced him; and he also said, “I will oppress Moab”. -s ofIsrael. I built Aroer, and I made the highway in the Arnon. 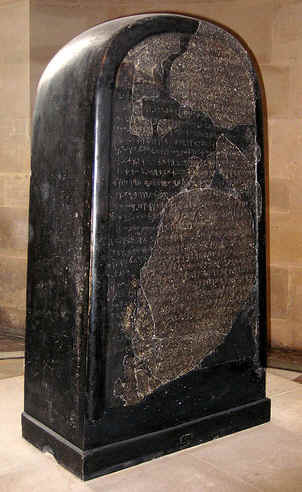 The stele corroborates events in 2 Kings 3. Kings mentions that Moabwas subject to Israel, but it does not name the king who subjected them (so it could have been Omri as the stele says). Who did Moab rebel against? 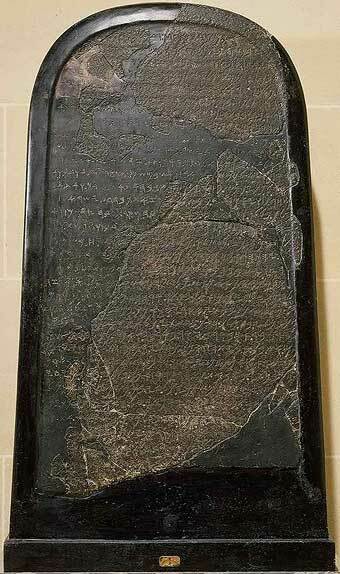 According to the stele it was the son of Omri (Ahab), but according to 2 Kings they did not rebel until after the death of Ahab (2 Kings 1:1; 3:5). Kings implies that they rebelled first against Ahab’s son Ahaziah (reigned 2 years), and continued to rebel against Jehoram (nothing in 2 Kings 3 requires that we see the rebellion as beginning under Jehoram, but it would be ok even if that was the meaning). Is this a contradiction? No, not if we understand “son” to mean “descendent of.” Perhaps Mesha mentioned the grandfather (Omri) rather than the actual father of the king(s) he rebelled against (Ahaziah, Jehoram) because Omri was the one who was responsible for the defeat of Moab. This might also help us make sense of Mesha’s mention of the king of Israel being present in Madaba for 40 years. Omri only reigned for 12 years and died. But Ahab reigned for 22 years, Ahaziah 2 years, and Jehoram reigned for 12 years. Assuming Omri defeated Moab early in his reign, then Moab would have been subject to Israel for 36 years. It contains the earliest extra-biblical reference to YHWH in any artifact. It may also contain a reference to the “house of David.” In 1994, André Lemaire argued that line 31 should be translated “as for Horonen, there lived in it the house of [D]avid.” To support this translation Lemaire had to supply one missing letter: the Hebrew letter “D” for David’s name. If Lemaire is correct, then this would be the earliest extra-biblical reference to King David. Biblical Archaeology Review, May/June 1994, pp. 30-37.